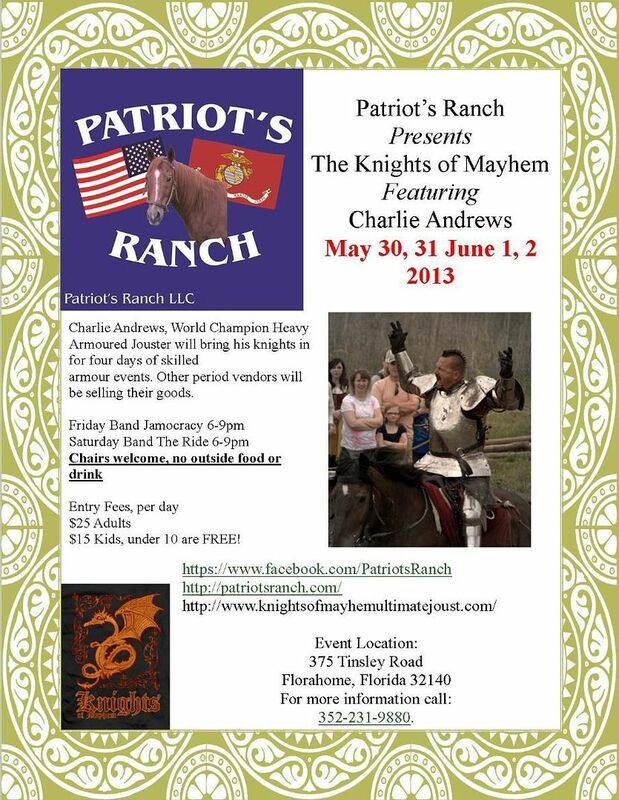 "The Knights of Mayhem Ultimate Jousting Event" is this weekend, May 30 – June 2, 2013, at Patriot's Ranch in Florahome, Florida. Patriot's Ranch is a veteran owned business and part of the proceeds from the event will go to The Destroyers Chapter of the Second Marine Division Association, a veterans organization. The event will include two different styles of jousting – jousting with frangible lances and ecranche, and the style of jousting Charlie Andrews is famous for, jousting with straight solid lances and gridded grand guard. There will be two sessions of jousting each day, as well as other entertainment. Jousters will include Charlie Andrews, Eddie "The Hit Man" Rigney, James (Wild Eagle) Johnson, Steve Hemphill, Scott Wilson, David Young, Nikki Fourtzialas, Jeffrey Wasson, Scarlett Coverdale, Thomas Nader and Patrick Neill. Click here to see pictures and biographies of the jousters. You can find out more about the event on "The Knights of Mayhem Ultimate Jousting Event" website and Facebook page.